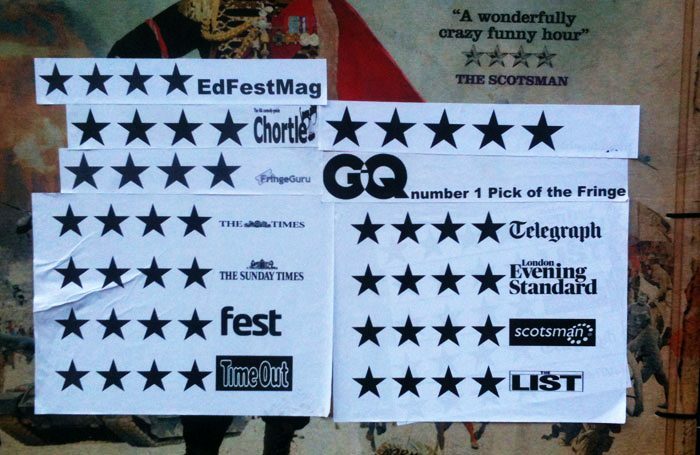 Mark Shenton: How far should producers be allowed to twist reviews in publicity material? We critics have long accepted our role in the forever-hungry theatre publicity machine. In return for the access we are (mostly) freely given to see and review shows, we allow our words, when favourable, to be quoted in ads and on front-of-house boards. One of our favourite pull quotes so far from Ann Treneman at The Times, what an absolute treat. However, there’s a basic protocol that we will be quoted accurately and that our words will not be taken out of context. And by and large, this is adhered to – and if a quote needs a tiny bit of ‘massaging’ in some way to fit the promotional narrative, ad agencies typically at least ask for permission first. Of course, this reductionist way of reviewing is already happening: it’s called star ratings. And a supposedly unambiguous way to trumpet critical success is for shows to simply list their four and five star reviews, with the outlets named so the reader knows that they came from credible sources. At Edinburgh, this is typically stretched with a plethora of rave star ratings credited to outlets no one has much heard of. But at least there’s an independently verifiable way of checking out the truth of that advertising. However, last weekend I came across an ad for a new touring production of Grease that will hit the road next year. It is based on a version that was launched in 2016, which received four-star reviews in the Times, Telegraph and Guardian. However, for this new revival, Arlene Phillips has replaced Nick Winston as choreographer – although many other creatives remain the same. Given that a key creative component has now been changed, is it still okay to use the old star ratings? But some producers occasionally have fun with their quotes and accolades, in a way that might be misleading but isn’t dishonest. As Jordan also pointed out, the Broadway transfer of The Play That Goes Wrong mischievously trumpeted its Tony success for winning awards in all the categories it was nominated in. It failed, of course, to mention that the design category was the only one in which the show was actually nominated.